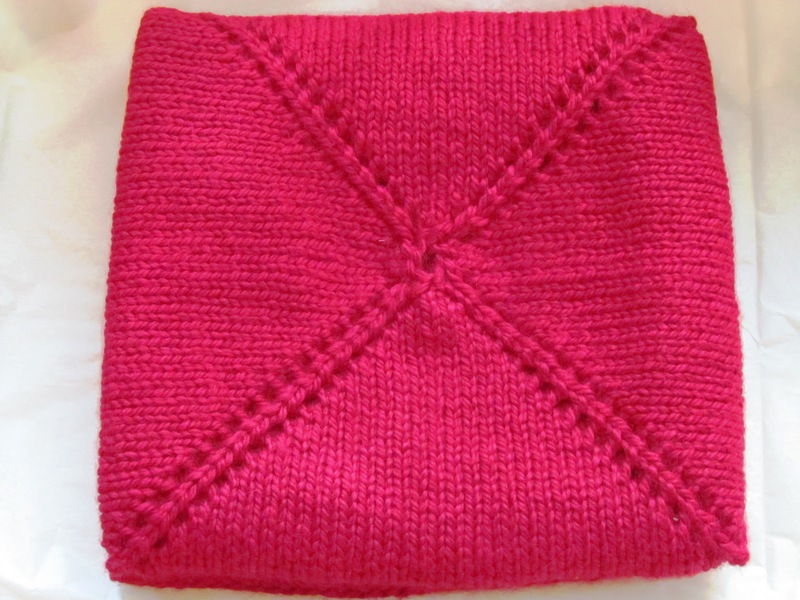 The other thing I shipped off to Steph was the red baby alpaca blanket I’d been knitting. None of the pictures I took really captured the color but trust me, it’s red. I went with red because a) it was gender neutral; b) it went with the lobster quilt; and c) I figured any baby born close to Christmas needed a red blanket. Obviously something knit out of alpaca is hand-wash only, a terrible idea for anything baby-related, but it’s SO soft that it belongs next to a baby, practicality be damned. Also, I soaked this thing a number of times and the water consistently ran pink. I would feel terribly if it ruined anything really nice; I’m hoping I got the bulk of the excess dye out. I did warn Steph, just in case. I used the Purl Dreams pattern, modified with a hemmed edge instead of a ruffled one; details here for you Ravelry folks. This entry was posted in Uncategorized and tagged FO 2014, Knitting. Bookmark the permalink.